Each of the Best Picture nominees is about a hero, whether they think so or not. Or whether you think so or not. Because what is a hero? Someone who is noble. Someone brave. Someone who puts others before themselves. A person who saves others. Or saves themselves. Or thinks they’re saving others, or thinks they’re saving themselves. Heroism can be a very loose term, but I certainly think it applies to our nominees, and in these Profile columns, we’ll be taking a detailed look at how each film fits into the larger narrative of what it means to be an Oscar-winning Best Picture. And I can’t think of a better place to start than with Captain Phillips. Captain Phillips is based on a true story, adapted from the account of Richard Phillips, who, in 2009, was taken hostage by four Somalian pirates after protecting his crew on the Maersk Alabama. Phillips is eventually saved when the Navy SEALs arrest the Somalian ringleader, and take down the remaining pirates. This is the sort of film that justifies the Academy’s decision to expand beyond 5 Best Picture nominees. This would never have been nominated in the old system, and frankly, I don’t think it has a chance of winning at all (at least in this category). 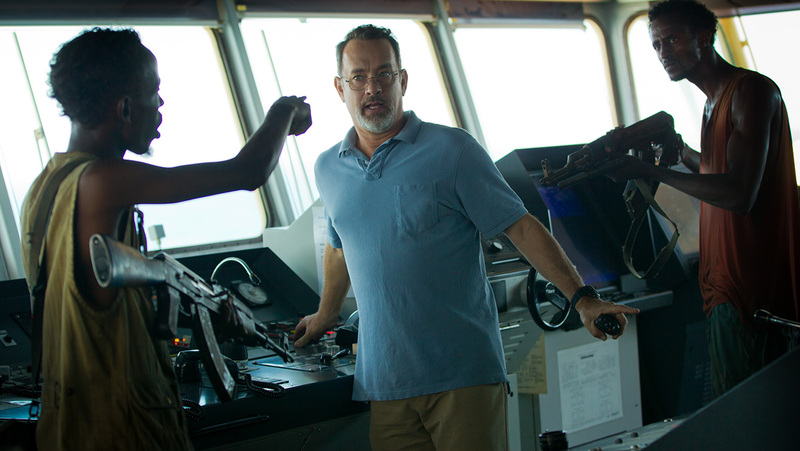 But Captain Phillips rises beyond being just a glorified action-thriller thanks to one crucial element; Tom Hanks. Hanks plays the titular captain with great strength, a born leader, aware of what actions to take once the pirates are spotted, and able to stand his ground and keep his cool even when being taken hostage by the Somalians. It registers as a good performance, one we can expect from someone like Hanks. But in the last 10 minutes of the film, when the SEALs take out the pirates, and the weight of everything finally registers for Phillips, we see his terror in a frightening physical incarnation. His body trembles as he is receiving a medical examination after the event, he can barely answer the doctor’s questions; he’s the shell of the man we have watched for the past two hours. It’s a powerful image to show us the repercussions of the actions that took place. It’s a performance unlike anything we’ve seen from Tom Hanks. We also get a humanization of Phillips’ captors, led by the late-teens Muse (Academy Award nominee Barkhad Abdi), and we see that they aren’t bad per say. This is the way of life they’ve been trained to lead. The criminals who rule their lives force them to think this is their one shot at fame and glory. We truly feel their plight, and the juxtaposition of the lives of two captains (Muse and Phillips) is one that makes this film not just good, but great. This is a powerful story. It’s a story worth telling, about a captain who protects his crew, and the value of a human life. Captain Phillips most likely won’t win Best Picture, but I’m happy to call them a damn good Best Picture nominee.